Now that we’ve passed the midsummer point, we’re definitely into our summer routine. Typically, we work hard all week, then Friday evening, we travel to Maine, where we spend two days doing not much of anything. Despite sometimes being tired for the drive, it’s worth it to be able to wake up Saturday morning and be where we want to be. We usually have no agenda. Typical highlights are: sleeping late (for me), eating relaxed meals with fresh local ingredients, reading on the dock, swimming when it gets hot, canoeing or kayaking around the lake for a change, doing some garden work if we’re feeling inclined. The past few weekends, the blueberries have been ready for picking. We have a huge bush next to the dock and other bushes scattered in the woods. We’ve already picked a couple of quarts. These are not the lowbush blueberries that have tiny blueberries that people think of as “wild Maine blueberries”. These are highbush, but also wild. 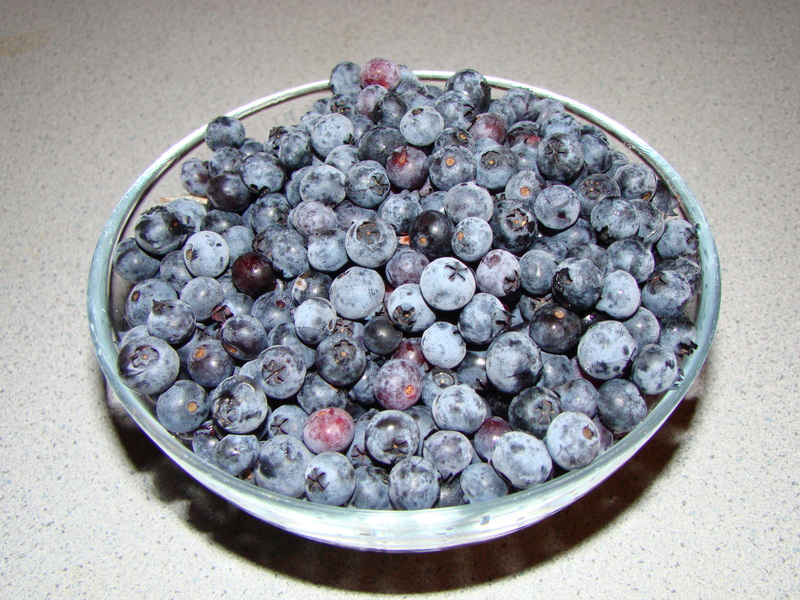 The berries aren’t as big as Jersey blueberries, but they are sweet and tasty. Mostly I’ve been eating them straight or mixed into thick Greek yogurt. I think a batch of blueberry scones is somewhere in my future. The local farmstand has started to sell freshly picked corn. I like, but don’t love, corn. On the other hand, Howard LOVES corn. He’s eating at least two ears a day now, and that should keep up for another month or so. The local farmstand also has tasty, ripe tomatoes. 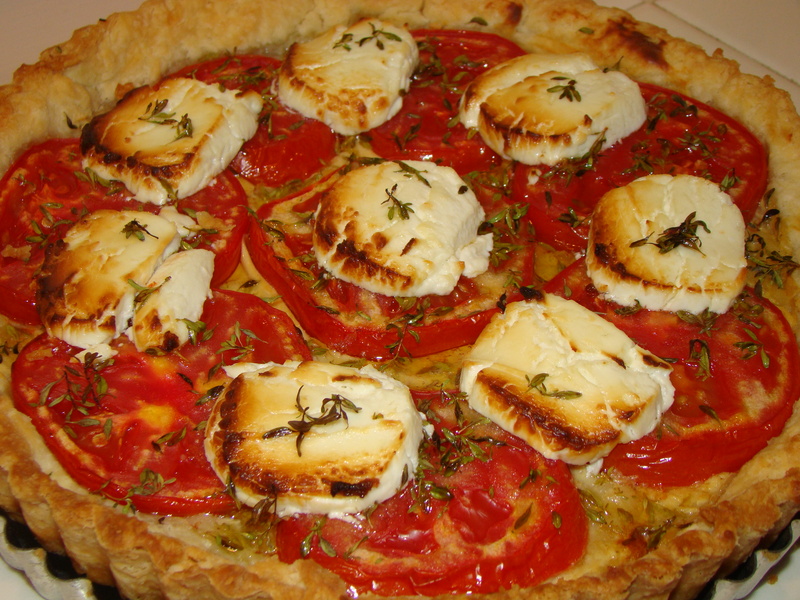 For lunch on Saturday, I made a tomato and goat cheese tart. It was yummy and very elegant looking. The tart dough was rather soft, so next time, instead of trying to roll it, I think I’ll just press it into the pan with my fingers. Even though the dough was soft, it baked up to be quite crisp. We ate half, the but leftovers held up for another day quite well. To make the dough, whisk together the flour and salt in a bowl. Add the butter and use your hands, or a pastry blender, to break in the butter until the mixture has a crumbly, cornmeal-like texture. Whisk the egg with 2 tablespoons of water. Make a well in the center of the dry ingredients and add the beaten egg mixture, stirring the mixture until the dough holds together. If it’s not coming together easily, add another tablespoon of ice water. Gather the dough into a ball and, with well-floured hands, press the dough into a 9-inch tart pan with a removable bottom, covering the bottom and sides of the pan. Spread the mustard evenly, covering the bottom of the tart dough. Let it sit a few minutes to dry out. Slice the tomatoes into ½-inch slices and arrange them over the mustard in a single, even layer. Drizzle the olive oil over the top. Sprinkle with about half the chopped thyme. Arrange the slices of goat cheese on top. Add the remaining fresh herbs. Bake the tart for 15 minutes, then check to make sure it isn’t burning. Turn the heat down to 350F and bake another 5-10 minutes until the dough is cooked, the tomatoes are tender, and the cheese on top is nicely browned. 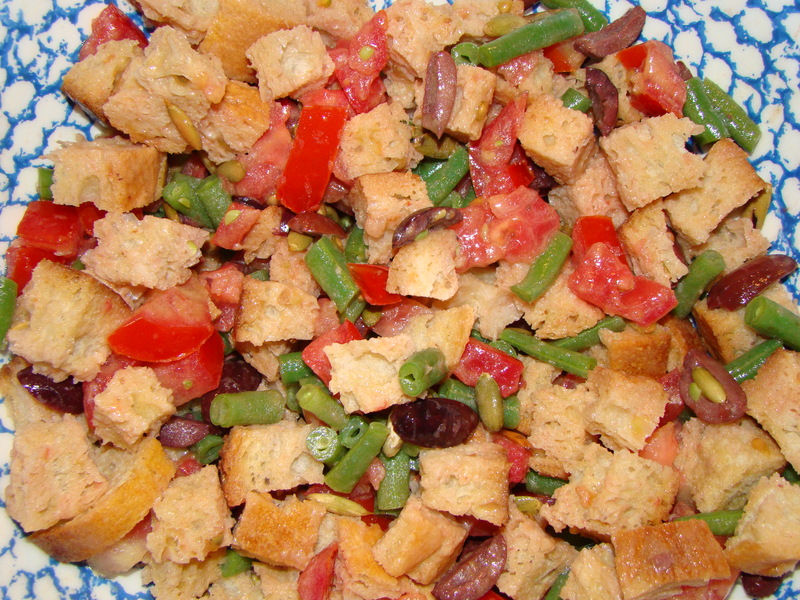 Another one of my favorite salads, year round, is bread salad. If you haven’t had it before, you might think it sounds either boring or disgusting. It’s not either. It’s certainly not for anyone on a low-carb diet. I actually have several different bread salad recipes that I make. A couple use homemade croutons from a good loaf of bread. There’s one with Tuscan flavors and the one with Mexican flavors. I also make a Middle Eastern bread salad called Fatoosh with toasted pita bread. 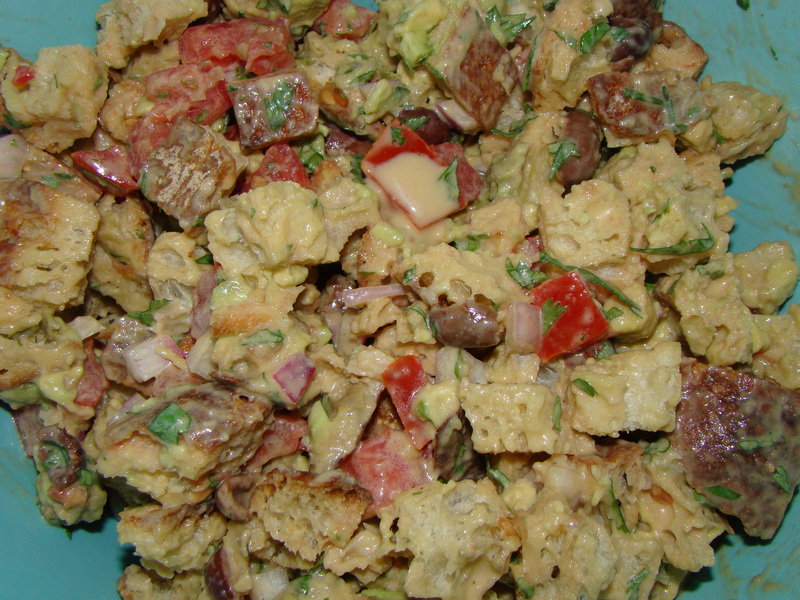 I first discovered my favorite bread salad recipe in a Rick Bayless cookbook. The way I make it most often now still bears a resemblance to the original recipe with my own touches. His recipe used a Caesar dressing with croutons, tomatoes, scallions, olives, and cilantro, which I still use, but I make an eggless dressing, left out the cheese, and add a avocado when I have one. This is another salad that is flexible about its ingredients. I had leftover dressing from a batch made earlier in the week, but I was out of some of the ingredients I like to use. What I did have were fresh green beans, so I cut about ¼ pound of the beans into 1-inch pieces, cooked them, and mixed them in. The beans gave the salad great color. I also threw in a handful of toasted pumpkins seeds. You can also substitute chopped onion for the scallions, if you prefer. My favorite local bread to make the croutons from would be a Francese from Iggy’s Bread of the World. I don’t bother cutting off the crust. I make fairly large croutons, ¾ to 1 inch cubes. In the evening, I’ll cut up a whole loaf and toast the cubes in a 350F oven for 8 to 10 minutes, until they are just slightly brown. Then I’ll turn off the oven and leave it overnight. They turn out just right. If you plan to use them right after toasting, they probably need to bake for 10 to 15 minutes instead. While this salad is best in the summer when ripe local tomatoes are available, I’ve made it successfully with a carton of grape tomatoes in the off season. One other thing to keep in mind… Only make as much as you are going to eat right away. This salad does not keep until the next day. The bread gets too soggy, and it just doesn’t look or taste very nice. However, for just Howard and me, I simply halve the recipe and make it a few nights in a row. To make the dressing, place all the dressing ingredients in the blender and combine until smooth. To make the salad, put the remaining ingredients in a very large bowl. Toss gently to combine. Add enough dressing to coat all ingredients well. You might not use all of the dressing. Let it sit about 10 minutes before serving so the bread can soften up a bit.